They’re lying to you, you know. That’s right. They’re all lying to you. A quick search on Google turned up 162,000,000 hits for the term “weight loss”. That’s not an exaggeration. With that amount of information out there it’s not hard to understand why people have so difficult a time knowing what to do. A couple of months ago Ashton Kutcher and Demi Moore made headlines when they twittered that they were going on a maple syrup, lemon water and cayenne pepper diet “for health reasons”. Gwyneth Paltrow’s personal trainer Tracy Anderson appears on multiple TV shows exclaiming that women should never lift more than three pounds. “The Biggest Loser” tells everyone that losing two pounds a week is a low number. Turn on your TV on a Saturday afternoon and you don’t have to go far to find an infomercial telling you that the new ab-roller/coaster/rocker can help you lose 25 pounds in two months if you use it for only 15 minutes three times a week. They’re all lying to you. The weight loss industry is multi-billion dollar-a-year business. That’s billion with a “b”. There are diets that tell you to eat no carbs. Diets that tell you to eat no fat. Diets that tell you to eat whatever you want as long as you have this special pill first. There are exercise books that tell you to do hours of cardio and abs. Think about it. Does any of this really make sense? Have you noticed that on every weight loss pill bottle the label says something like, “Our studies have shown that if you take two of these pills a day along with proper diet and exercise you will lose weight.” Really? You mean that proper diet and exercise don’t do anything without your magic pill that costs $79.95? We know that obesity rates are skyrocketing. We know that this stuff is now being passed on to our kids. How can this be when a quick search can give me 162,000,000 pieces of advice? It’s because so much of this information is just out there to promote someone’s book or someone’s TV show or sell a pill. How do you know what to listen to? You’re in luck. On Saturday September 18th at the Inner Athlete in San Leandro I am going to be giving a free fat loss seminar at 1:00 pm. I am going to talk about these lies and tell you what the real truths are behind fat loss and how you can figure out the difference. The Inner Athlete is located at 377 Macarthur in San Leandro. 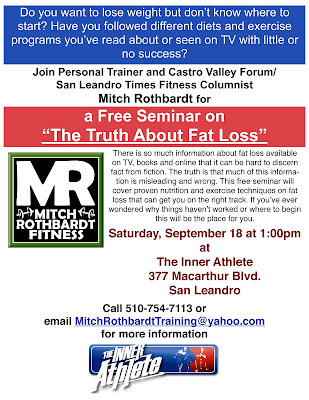 Please call me at 510-754-7113 or email me at MitchRothbardtTraining@yahoo.com if you have any questions, or just show up. It’s free and I hope we can help help a lot of people. Have a great week and I hope to see you there!